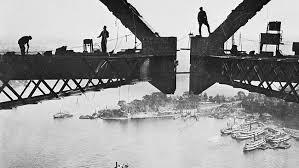 SYDNEY HARBOUR BRIDGE – a great story of engineering and enterprise. Murray Gosper was the Uncle of the contributor who is believed to be one of the first editors of the Sydney University Newspaper the "Honi Soit" and Gosper Lane at Sydney University was named after him. He was studying Civil Engineering when he discovered the "Bridge Ghost". Courtesy of R. Ford, Member, 2nd Fleeter.